MsgBox “The record has now been Saved. The database will now close". will display in a message box as per below, with just the OK button as per below. 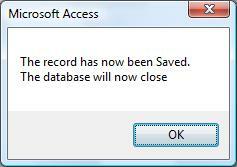 MsgBox “The record has now been Saved" & vbCrLf & “The database will now close". The vbCrLf forces the second sentence to the second row in the message box to. MsgBox “The record has now been Saved" & vbCrLf & vbCRLF & “The database will now close". This helps to make your message box easier to read for the user. Note: You cannot use the vbCRLF in queries, labels, or text boxes. the database will now close"
The Ctrl & Enter were pressed between 'Saved' and 'the' thus they are displayed on separate lines. Note: keep all the words within the talking marks. The label is the same, but without the '=' sign and the talking marks. Once again the Ctrl & Enter were pressed between 'Saved' and 'the' thus they are displayed on separate lines. Adding a line break to a query is a bit harder to do, the only way that maybe possible is to call a function to return formatted data.